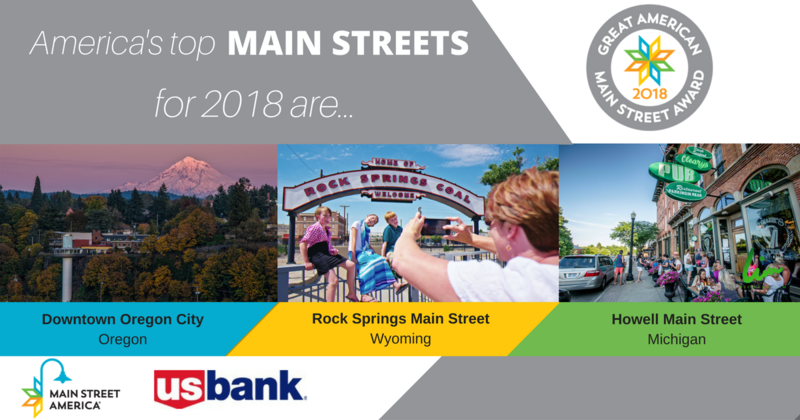 The National Main Street Center, Inc., announced Downtown Oregon City, Rock Springs Main Street/Urban Renewal Agency, and Howell Main Street as the 2018 Great American Main Street Award (GAMSA) winners during its annual conference in Kansas City, Missouri. The awards were made possible through support from U.S. Bank. To watch the Opening Plenary Livestream, go to https://www.youtube.com/watch?v=aAq6O6mzzqk.